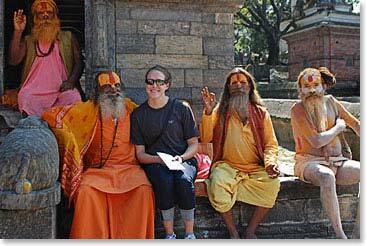 Our team has been arriving in Kathmandu slowly over the past few days. Wendy and Gerry were first; they came in from Doha on Wednesday, October 6th. 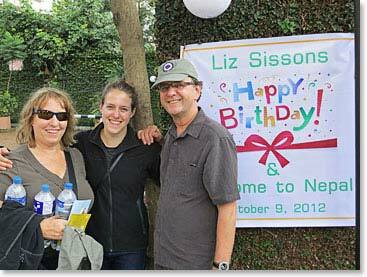 The Sissions, Clayton, Roxanne and Liz, along with Sharon and Jim, arrived late in the evening on Dragon Air from Hong Kong on Monday, October 8th. 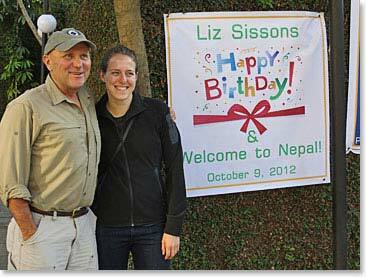 Liz was pleased to walk out of the hotel the next morning, on her birthday, and see a sign commemorating her special day. Kathmandu!! What a great place to spend a birthday! Fred arrived on Thai Airways from Bangkok around 2:00pm, and by 7:00pm, Tina, Lauren, and Alex had arrived from London via Doha. With the entire team together now we are ready to begin. We’ve enjoyed some time shopping and touring Kathmandu today, but tomorrow we will have a very early departure for the airport to catch our flights to Lukla. We will leave the Yak and Yeti Hotel at 4:30am! It is great to be together. It seems obvious that this is a fun loving, adventurous group! 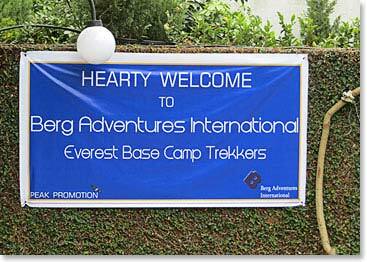 We’ll have great times ahead along the trail to Everest. 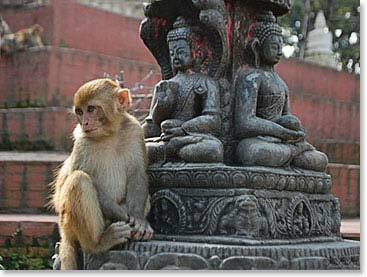 Adorable rhesus monkeys are everywhere at the Swayambhunath temple, this is why Swayambhunath is known worldwide as "monkey temple". 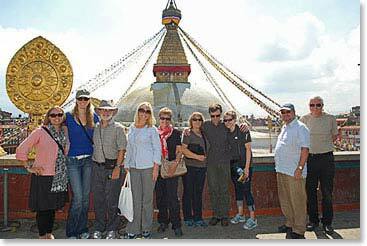 Team photo at Boudhanath - the largest Buddhist temple in Kathmandu Valley. Wendy wanted some rest before our early morning departure for the trek tomorrow, but the rest of the group is here.